At Pioneer homestead we usually try and stick to a pretty healthy kitchen but with the pressures of work and the Juniors' picky palates, it's fair to say we hit the golden arches way more than we really should. 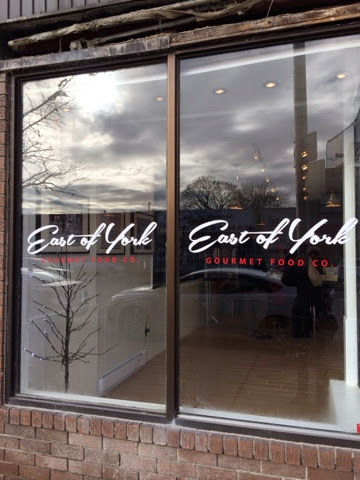 If you're in the same boat, you'll be happy to hear about Danforth East's newest delectable destination called East of York Gourmet Food Emporium at 1904 Danforth. When Pioneer popped in earlier today to meet chef and proprietor Ashvin (or Ash as everyone calls him), the space was already filled with delectable aromas as he prepped for his soft opening day. He wasted no time in helping us fill our belly with his first offerings while chatting happily about how East Of York went from dream to reality. 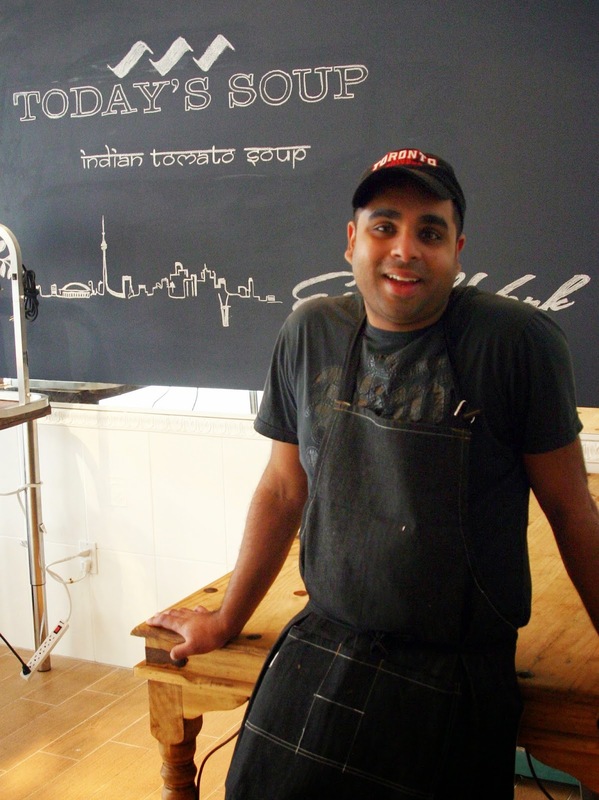 A former banker turned caterer, Ash had a vision to bring healthy (affordable) gourmet to the people of East York in a store-front catering format. He has lived in and around East York for practically his whole life and has witnessed the change in the neighbourhood first hand. He feels proud to be part of this community (and has a 1.5 minute commute to work!). In his own words he says "it feels good be part of something special happening here". Well, we're glad to have you! All the East of York menu items are $1 each or 12 pieces for $11 and the offerings will rotate every few months. Ash promises they will be low in saturated fats, low in sodium but very high in deliciousness. It's mostly small fare, but enough of a combination that a family or four could easily fill up for dinner. East of York is open every day from 11 - 7 except for Mondays and holidays! Bon Appetit! We have ALL been eagerly anticipating the opening of Local 1794 since Pioneer blogged about it back in the lazy hazy days of summer. The leaves are all falling now, and the sky is grey (cue the Mamas and the Papas) and the windows of this local gem are still papered up while the resto waits for the City of Toronto to upgrade water service. However, we have great news! Pioneer's sleuthing skills have determined that all the issues will soon be resolved and Harry is only weeks away from firing up his brick oven and opening up the 25 craft beer taps. Wowzers! 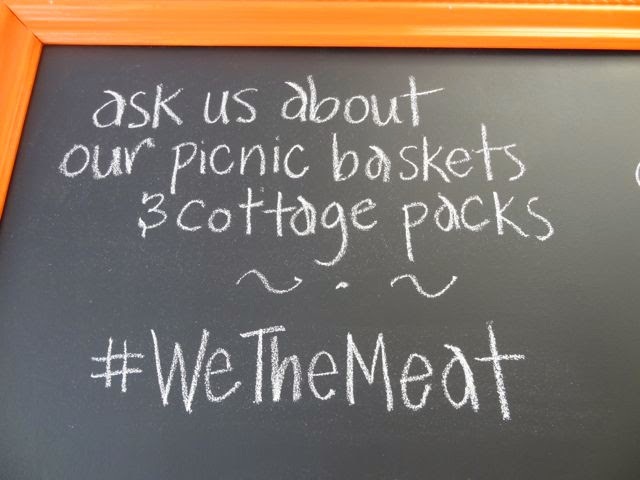 Even writing that makes our mouths water. Looks like we better get moving on a reservation. See you there soon! It's only been a year since gastro-love hit a fever pitch in the nabe when The Wren opened, but it seems like an eternity in comparison to the pace that restos open and close in the west end. Pioneer's been eying the sleek new sign and trendy garage doors at 1794 Danforth with anticipation, wondering what's behind the craft paper obstructing our view. Never one to let something like that get in our way, we decided to pop in for a surprise tete-a-tete with Harry, the owner of new restaurant Local 1794. The old Columbo's space is unrecognizable - what was once 85% kitchen and 15% fast food counter, is now a beautiful, sophisticated space lined with comfortable booths, cedar wine racks and probably the longest wooden bar on the Danforth. Harry said he's going for the casual comfort look and feel, designing the space himself to get the right atmosphere where the Junior Pioneers can feel comfortable throwing around pizza at kiddie happy hour, and Pioneer and her gal pals can guzzle red wine and appies late into the night. Speaking of pizza, the old Columbo's pizza oven was completely rebuilt and Pioneer is just waiting for the green light to head over for some mouth-watering, hand rolled stone baked pizza pie. Harry's menu won't be focused around Italian food, but will be a mix of some solid mains with lots of fresh appetizers, salads and rotating specials from the smoker. 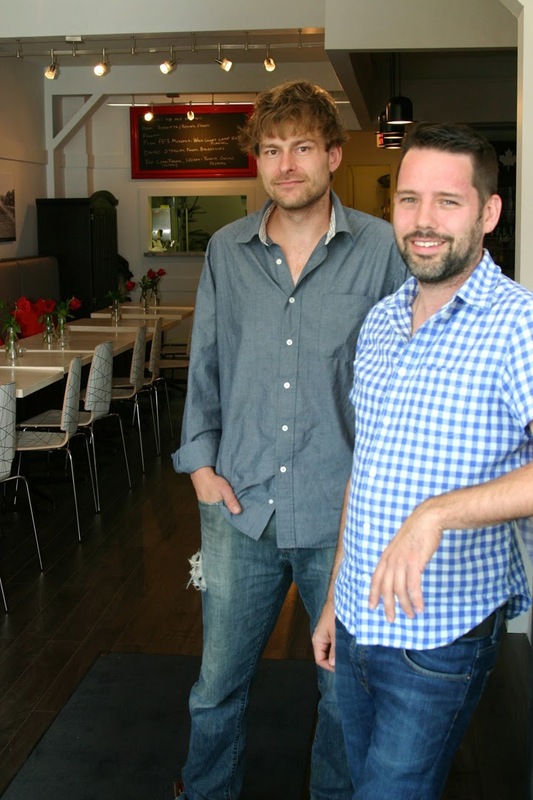 We bet you're wondering about the magic question: when will Local 1794 open? We'll have to wait and see. The City of Toronto is holding the water pipes hostage at the moment, and we all know how these things work. So keep your eyes peeled on 1794 Danforth for the opening of a very welcome addition to the block - but until then, it will have to be a surprise! We've been meaning to post this for awhile, but sometimes summer & wine & life on the Danforth just gets too fun to find time to write. 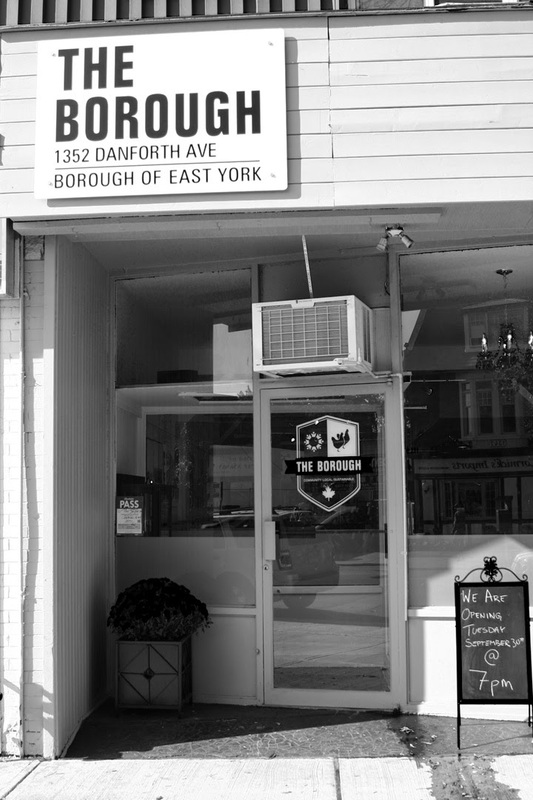 So, it's not really news that we have a new butcher shop called Stock N Trade (1272 Danforth). By now, I'm sure you've all tried their fresh, hand made mouthwatering sandwiches or picked up some of their made in Ontario meat. So since it's Friday, we'll just post one quick photo of something that we love about this new place: they make picnic baskets made to order! If you're out pioneering at the jazz fest, or heading out to pioneer the actual northern wilderness, Stock N Trade will pull together a fantastic picnic basket assortment of marinated meats, cheeses, sauces and the like. No need to sweat the small stuff if your in-laws are dropping by dockside - just throw something on the grill and grab a fresh margaritas! This blog has always been about exploring along Danforth East, but sometimes you don't have to go too far to discover something new. On Friday night, Pioneer and the juniors left Daddy Pioneer at home to slave away on our current renovation project while we enjoyed a 5-star meal at the Bus Terminal. You might think we are joking but here is one of those golden local tips that always amazes us! Previous to this dining adventure, the Pioneer clan had never ventured into the retro diner at Coxwell and Danforth past a certain hour of the morning. Eggs and bakey were pretty much all we've ever ordered. We blogged here years ago about a summer sangria special at the Terminal, but what's Sangria without the patio? It was only due to an invitation from another EEWSK (east ender with small kids) that we ended up at the empty, child friendly resto at dinner hour where the junior Pioneers and friends embarked on a (not so) quiet riot with their chicken "dolphins" and fries. A diner is a diner, so we expected the usual 'specials' menu but did a double take when we noticed a lamb curry and a lamb and lentil stew on the board. My inside source, who is a Friday regular, let it spill that the Friday curry is "to die for". Although we can't confirm it happens every Friday, the Sri Lankan staff and owners apparently make their own special curry from scratch. Pioneer couldn't resist a steamy (reasonably priced) bowl of stew and the verdict is that it IS to die for. So next time you're craving the slow burn of a lamb curry, don't walk south to Gerrard, head on over to the Bus Terminal for a one-way ticket to delicious! This past weekend found Pioneer and the Juniors trudging happily along Danforth East looking for a snack. From the caboose (ie. the red wagon) the Juniors were happily chanting "cupcakes, cupcakes, cupcakes". What's a Pioneer to do? After coming up empty at the Patisserie, a friendly passer-by pointed us westward to a brand new bakery called Sweet Serendipity which was exactly what a tired mommy was looking for. Sweet Serendipity (1335 Danforth) opened April 19 and we are very sorry we didn't find this gem sooner. The airy space with it's white walls and hardwood floors is soon to be a favourite local hangout and a welcome addition to the block between Monarch Park and Linsmore. We didn't get a chance to chat with the owner Pina, but that's ok, because she was busy whipping up more of her delectable homemade baked goods. The fridge packs a colourful selection of cupcakes, pastries, cookies and cakes into a mouthwatering display - all of them baked at the back of the shop by Pina herself. Pioneer could happily slip into a sugar-induced coma in this place. 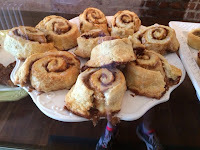 We chatted with Stacy behind the counter who mentioned they are now also offering fresh cinammon rolls and scones to nibble on with your latte. The Juniors picked out their treats and it was love at first bite. 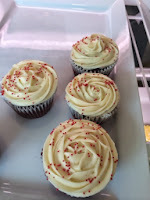 Not that we are conoisseurs but we do eat a lot of cupcakes and these ones are excellent - light and fluffy icing and a moist, non-crumbly cake. Yum! Pina does custom orders for anything from cupcakes to cheesecake. Sweet Serendipity could easily be an every day destination for this Pioneer (other than Monday's when they are closed) - how many cupcakes a day is reasonable do you think?? Well, spring has almost sprung, and Pioneer is back for another season of exploring #DanforthEast. It's almost our 5th anniversary and to mark this milestone (and in the spirit of spring and renewal) it's time for a look back at where it all began. TheGrid.TO wrote a lovely piece about DECA and it's urban renewal efforts. They have played a key role in making this a safer and more interesting place to live. It's worth reading, if only to get a glimpse of what our neighbourhood looked like when Timmy's at Shoppers was the only place to get (gross) coffee. If you don't already read their blog, you should! It's over here at decadiaries.wordpress.com. 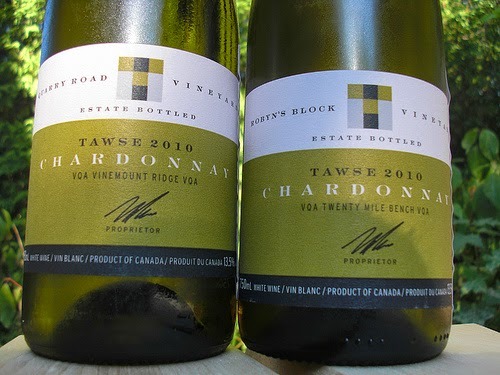 Reading our first blog post five years ago was a real throw back: http://eastendpioneer.blogspot.ca/2009/04/welcome-to-east-end-pioneer.html. As you can see, nothing has changed. We still feel the same way. We heart Danforth East!